This date night was a fancy one. We went to The National for a drink and a quick bite before we went to the Chamber Magic Show. 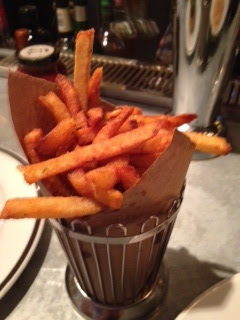 The National is the newest NYC offering from Chef Geoffry Zakarian, and the place looks really cool and retro. We sat at the light gray metal bar which had a lot of activity. The bartenders are a flurry of activity. The National has an interesting cocktail menu, and a small herb garden at the far end of the bar that I noticed the bartenders used for the drinks. Can't get fresher than that. 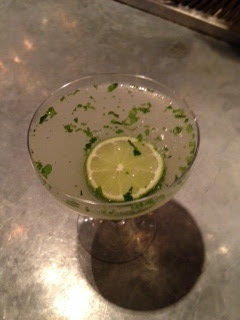 I went with a boring glass of wine and Gramercy Guy had this refreshing drink, which I have to admit, I forget the name, but it had gin, herbs and lime. 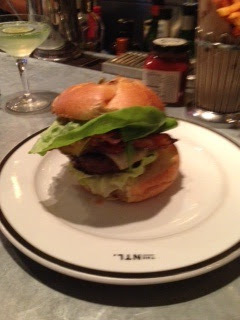 For dinner, Gramercy Guy had the ugly burger. He said it was great with lots of nice elements. The only ugly thing about this burger was the mess it made. Word of advice: don't cut it, and when you pick it up, don't put it down until there is nothing left. That's one of the reasons, I wasn't able to get a taste. The fries had a great spice to them, smoked paprika, I think. 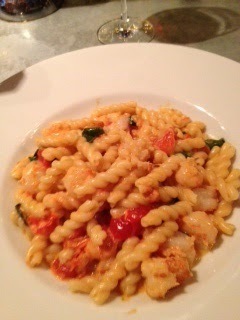 I had the rock shrimp pasta. It was good with a very light cream sauce. The best part, it didn't feel a heavy lump in my stomach all night like some heavy pasta dishes might. Then we were off to Chamber Magic, an intimate magic show in the Waldorf Towers. The tickets say cocktail attire, and, Steve Cohen, the Millionaire Magician says he tries to evoke the salons of yesteryear, when people dressed to go to their friend's homes where there was often entertainment, like a magician. Definitely take the time to get dressed, it makes the night feel special. Also, the few people not dressed stood out. I think when I told Gramercy Guy that we were going to a magic show, he was skeptical, but not after we left. This was a truly "how'd he do that" show. You'd might think that 1 1/2 hours of magic would be too much, but he switches up his tricks and has a great banter with the audience. You can sort of surmise how he does some of the card tricks, but there are others like Think a Drink that you leave you thinking about how he did it for days. There is little advertising for Chamber Magic, and he travels across the world doing this, so get your tickets now, you won't be sorry. They would also make a great gift alternative to a Broadway show. 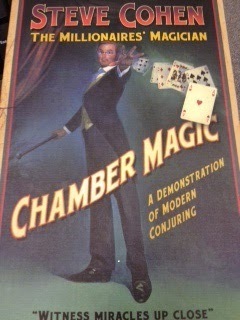 Have you been to Chamber Magic? What was your favorite part?